A U.S. spy satellite falls from its orbit and crashes into a pile of U.S.S.R. space junk, becoming entangled with a radioactive canister. The two fuse together in their descent towards the earth below. Moments later, we see that the woodsman has been transformed. He’s now some sort of hybrid between man, television and satellite! “What goes around, comes around,” the creature states, “What comes around… goes around!” With that, the cyborg morphs into a ball of fiery energy and flies off. The TMNT are working out in the sewers, still concerned about their missing brother, Raphael. Splinter and April are using the computers at April’s news office to do research when one of O’Neil’s co-workers arrives. Splinter hides while April has a joyful reunion with her friend, Malcolm, who thought she had been killed back in issue #14. The man asks April if she’s investigating the reports of the fallen spy satellite, but O’Neil states that she’s interested in something else. Malcolm politely excuses himself so April can get back to work. Splinter wishes to leave, and April sits at the keyboard to save her work – only to be pulled into the screen of the monitor by the cyborg! The Sensei tries to pull April free, but he’s too late and is blasted by the satellite dude. Later, Splinter explains to the Turtles what happened. Donatello hacks into the news station’s computers, attempting to trace where April was taken. Meanwhile, April is surprised to discover that her abductor is interested in having her interview him. The man states that he’s about to destroy the world’s communications systems – when April asks why, he tells her to grab her camcorder and he’ll explain everything. The fellow stands and explains that he first wnats to show people what’s really going on in the world: starvation, disease and war – and then he’ll shut everything down and force people to pause and think about what’s ahppeneing – and then, together, humanity can do something about the problems. He hopes this plan will work so he doesn’t have to do something more drastic – like using the nuclear waste within his body to irradiate the world’s oil fields and rendering them useless for human use. April declares that his plan is madness, and the cyborg states that he is mad – and he’s not going to take it anymore! 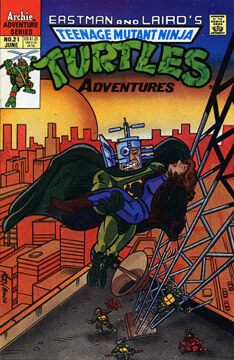 Just then, the TMNT come crashing through the window and battle the ‘borg, who finally reveals his name to be Vid Vicious. Vid dives into a nearby computer monitor, with Donatello close on his heels. The two are transported to a bizarre dimension and begin to fight, as the others ponder how to rescue their brother. Suddenly, the Shredder arrives with a gang of Super Foot Soldiers! A fight breaks out, and Shredhead manages to download Vid and Don to disc before destroying the computer. With his prisoners in hand, Shredder escapes!